These slow cooker cranberry meatballs are a 5 ingredient appetizer that are sure to be the hit of any party! I am sooooo tired of this crazy heat we’ve got going on here in California. It is hot and humid with no sign of it letting up any time before November. I’m dreaming of cooler weather and fall food, like these amazingly easy slow cranberry meatballs. These meatballs take just minutes to put together and they’re sweet, savory and absolutely delicious. I’m thinking this will be the perfect appetizer for Thanksgiving or really any fall get together! 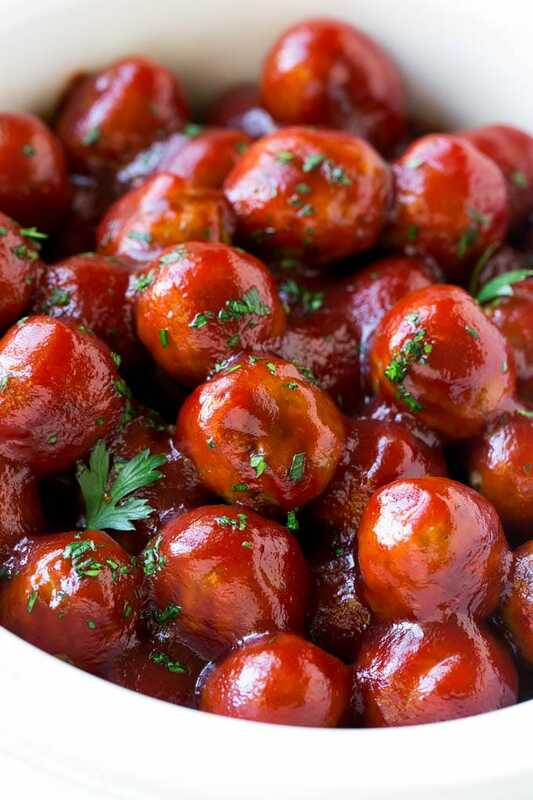 Here’s what you need to make this recipe: frozen meatballs, cranberry sauce, chili sauce, orange juice and brown sugar. That’s it!! You can add a little parsley for color like I did here, but that’s totally optional. You can use your favorite variety of frozen pre-cooked meatballs in this recipe. I like to use turkey meatballs, because turkey and cranberry is a classic combination that can’t be beat. Not to mention, turkey meatballs tend to be a little lighter than their beef and pork counterparts, so you won’t fill up too much before the main course. I use a jellied cranberry sauce because I like a smooth sauce for my meatballs, but you could use a whole berry sauce if you prefer. Remember those old school meatballs with grape jelly sauce? This is a similar concept expect the cranberry sauce keeps things on the more savory side because it’s not as sweet as grape jelly. 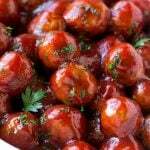 While these cranberry meatballs are perfect for appetizer hour, they also make a great dinner served over rice with a side of broccoli. I am so excited to serve these easy cranberry meatballs all fall and winter long, I know my family and friends are going to adore them! Place the cranberry sauce in a bowl and microwave at 45 second intervals until just melted. Whisk in the chili sauce, orange juice and brown sugar; stir until mostly smooth. 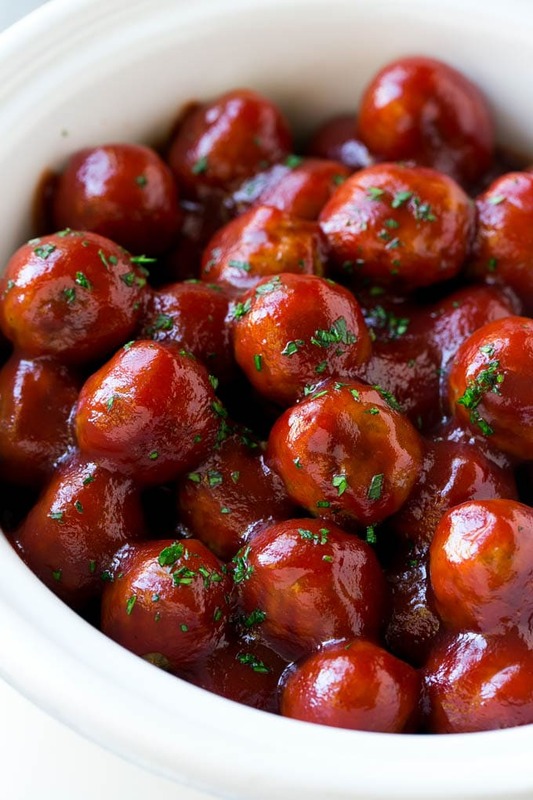 Place the meatballs in a slow cooker and pour the sauce over them. Cook for 4 hours on LOW then serve, topped with parsley if desired. Recipe adapted from Ocean Spray. This recipe calls for cranberry sauce! Can this be made a day in advance? If yes, how should they be warmed on the next day? Yes, you could warm them in the microwave or on the stove! Do they have to be pre-cooked meatballs? I make and freeze my own meatballs but wondering if I should cook them and then throw them in the crockpot or will they be ok to throw them in thawed out for maybe longer time? 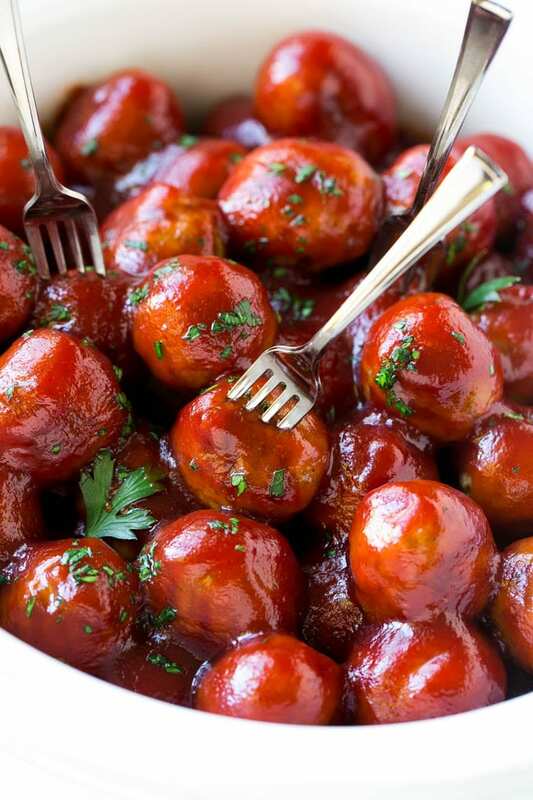 You can use cooked or uncooked meatballs, if you go with uncooked meatballs you should add an hour to the cook time! The crock pot shown in the photos is a 4 quart crock pot. What would be the recommended time for stove top cooking? My slow cooker is in storage this year! I would simmer for about 20 minutes on the stove top, or until your meatballs are cooked through! What can I use in place of orange juice? You could use apple juice or even just water! Am looking forward to making this as I LOVE cranberries. My ? as there are so many types ( let alone brands) of chili, could you be a little more specific. I want to use the right type. Thank you. For this recipe you’ll want to use a bottle of chili sauce, I typically buy the Heinz brand and it’s located either near the ketchup or BBQ sauce at the grocery store (it’s smooth and red like ketchup). Hope that helps! Perfect! Thank you for replying soon quickly. Everyone loves hot sweet meatballs! Expect this on my thanksgiving appetizer menu! Great crock pot party pleaser!